We were on our way to BR hills last weekend. Dawn had still not broken over and it was dark and still outside as we drove through slumbering hamlets. Deta (my father) kept up a constant banter on various topics. Perhaps he was concerned by the recurrent yawns let out by the husband, who was also our sole driver. I was meanwhile yapping away with my sister and cousins on our WhatsApp group. Thus, our talk shifted towards elephants. The elephants of Manas Wildlife Sanctuary. Of Bahardur Singh, the brave, in particular. Bahadur Singh was also one of the bravest elephants in the range. Unlike some of his ilk, his heart held no fear for the king of the jungle – the tiger. On the contrary, his rage knew no bounds if he came across a tiger. It was difficult to control him in such situations and it took great skill on the part of his mahout to calm him down. Deta then began to tell us a story on Bahadur Singh. Once, there was a report of a tiger being sighted regularly in the tea gardens adjacent to the forest. Although the beast had not attacked any worker yet, it still posed a great danger to their lives. They refused to enter the area and complained to the forest authorities. The tiger, on its part, was a wily fellow and it refused to budge from the tea garden. Besides, it was a huge area and not easy to track the animal down. Deta arranged for four elephants to scour the tea garden and flush the tiger out. Suddenly, on a hunch, as if a premonition had hit him, he called for the veterinary doctor along with all his paraphernalia and stationed him near the garden. Then, all the four elephants set out in different directions in search of the tiger. Deta had mounted Bahadur Singh and the area he had decided to patrol was slightly away from the actual site where the tiger had been observed. “I had purposely led Bahadur away from that area as there was no knowing what he would do in case he came across the tiger,” Deta explained. But fate had decided otherwise. For who would appear before Bahadur Singh a few minutes later but the villain of the piece – the tiger. “It eluded all the other elephants and had to present itself to Bahadur only,” Deta said with a slight bitter note. At the sight of the tiger, Bahadur Singh lost all his senses. With a tremendous trumpet, not unlike a war-cry, he charged at the stunned creature with all his might. The tiger regained his composure and growled back, but realised that Bahadur was no ordinary elephant. Its growl had only made matters worse. Bahadur kept up his mad charge and almost crushed the tiger underneath, before it cunningly slipped out and took refuge in thick undergrowth. It hid itself there and perhaps had made up its mind to stay there till the elephant left. But Bahadur could not hold his patience. He refused to pay heed to his mahout and with another stupendous cry, he ran towards the vegetation sheltering the tiger, flushing it out instantly. Bahadur then pinned the tiger on the ground and nearly stabbed it with his tusks. 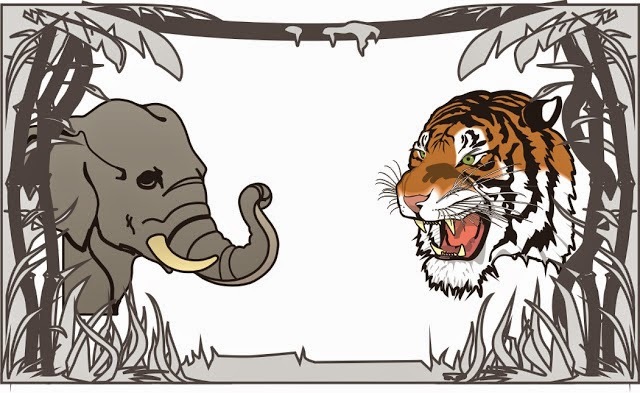 Just then, the hapless tiger, as a last resort to save his life, dug his teeth into Bahadur’s trunk, tearing it apart. Blood spurted out of the trunk uncontrollably and Bahadur slackened his hold over the tiger, allowing it to scamper away for dear life. Deta and the mahout got down and surveyed the damage – it was a serious injury, something that could cost Bahadur his life. Had it not for Deta’s amazing foresight to keep the doctor ready, perhaps it really would have resulted in Bahadur’s death. His breath was coming in gasps and a loud whooshing noise came from the tear in the trunk. The vet reached the site in no time and cleaned and bandaged the bleeding trunk. It was no use putting stitches as they would come off. Bahadur was a strong and healthy animal and the wound healed quite fast, much to the relief of the entire forest department. But he still remained the adamant bull that he was and even this incident failed to change his devil-may-care attitude. Or his rage for tigers. For, Bahadur Singh was truly The Brave. Note: Bahadur Singh was shot down by Bodo insurgents, after Deta left Manas. It wrenches my heart apart to know that this magnificent elephant, who fought tigers and survived battles, had to meet his end this way, in the hands of an inferior species that call themselves men.